Oh, I just LOVE broth soups. Ok, I love certain cream soups too (creamy tomato basil, and broccoli and cheese, but that is about it for the cream soups). 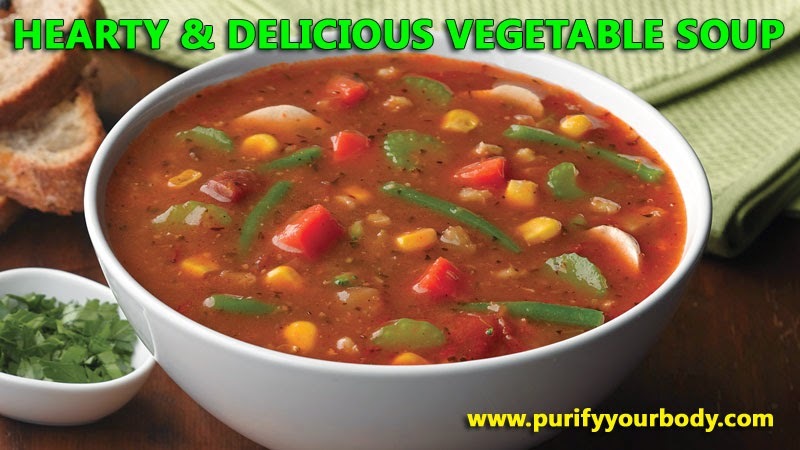 This is my favorite vegetable soup recipe. And, you can mix and match vegetables to make it fit with what is in season now, or what you have available. If you don't have fresh vegetables, you can even throw in frozen vegetables (but please avoid canned veggies). If you don't have fresh herbs, then definitely don't despair. Use dried herbs. If you don't like beans, or are gluten free, leave the beans and leave the barley out. Heat oil in a sauce pan over medium-high heat. Add onion and garlic and sautee' for 2-3 minutes. Add all ingredients to a large crockpot except the barley (if you choose to use it) and the spinach and cabbage. You will add these an hour before finished. Cook on low heat for 6 hours or medium heat up to 4 hours. Please note: Times are approximate, depending on the temperature of your slow cooker. You will know that when the celery and carrots are soft you can add the barley, cabbage and spinach. You also can use your judgment in seasoning -- I strain the basil leaves out at the end. I don't use the rosemary. I add additional salt, and less pepper. It is all "to taste" and depends on your preferences. And, I personally top my soup off with a HUGE amount of shredded cheese -- usually mozzarella. And then salt it even more. This makes a great lunch, or a starter course for dinner. I usually make a loaf of homemade bread and serve it with the soup for my husband (I am gluten free). Colloidal silver is the secret weapon in the world of water treatment. It’s safe, natural and extremely effective in treating water because it destroys all manner of waterborne nasty stuff. Silver has been used for centuries… thousands of years really… as a natural antimicrobial. Nobody knows how humans figured out that elemental silver had some really cool natural antiseptic qualities, but there are records of Gretians using silver coins to maintain the quality of milk and other liquids. That has carried into the modern era and has been enhanced with the advent of colloidal silver. 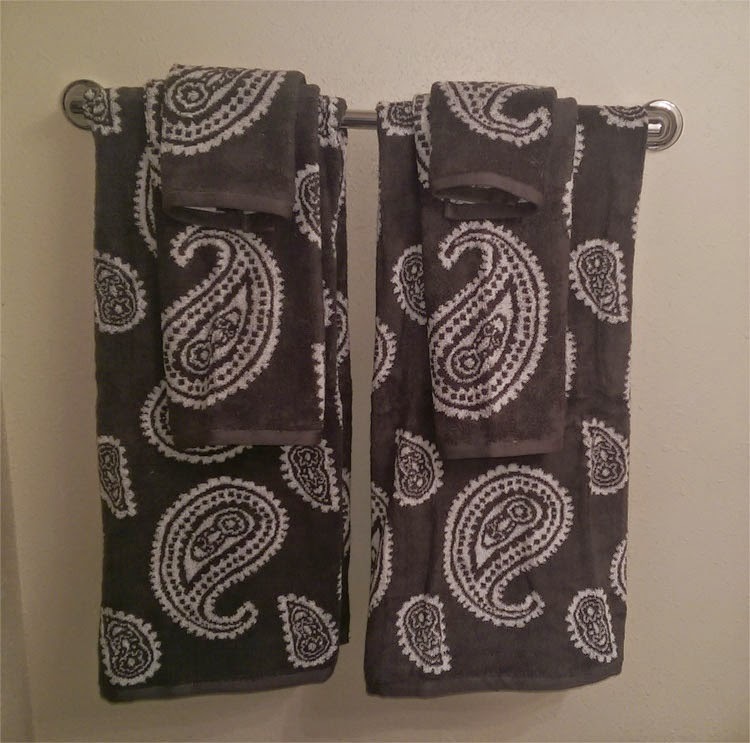 Luckily, this may be the simplest and most common application for colloidal silver. It’s one of our favorites and a secret weapon for those who enjoy the outdoors. 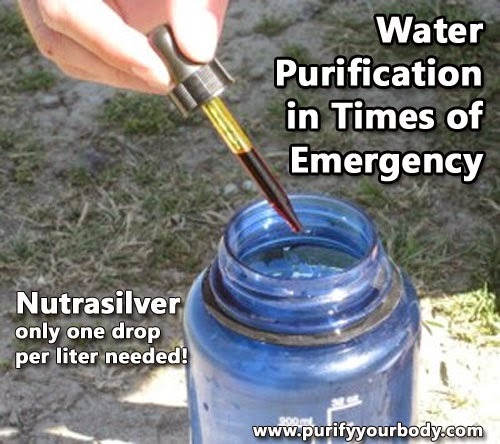 NutraSilver is the preferred alternative to water filtration, iodine tablets, chlorine drops and UV light because it is light weight, non-toxic, effective against all microbes, and it goes a long way (one drop treats a full liter). Collect the water you would like to purify in a container for which you know the volume. Add one (1) drop per liter of water. For a 1 liter bottle, add one drop of Nutrasilver. For a 4 liter bladder, add four drops, etc. Let the container of water sit for 15 – 20 minutes. No need to shake the container, the silver will automatically mix itself evenly. The NutraSilver, for a typical stream-based water source, works in about 6 minutes but we ask you to wait a bit longer for good measure. NOTE: If the water you are drinking is very questionable… from stagnant water or lake instead of a stream or river, add two drops for good measure and wait a little longer. Under extreme conditions, say, stagnant pools in slot canyons, filter the water through a shirt or article of clothing and then add two or three drops per liter. After 30 minutes you can drink safely. Best part about all this? Your water tastes delicious and the NutraSilver actually does your body good. Very cool. In cases of extreme emergency where toxic chemicals are present in the water that you are wanting to treat, colloidal silver will not guard against that. That said, in those cases, the pathogens would probably kill you quicker than the unwanted chemicals so colloidal silver probably keep you healthy in most extreme cases. But just realize it does not neutralize chemical contamination at all. Colloidal silver seems to be all the rage these days, with the potential to be helpful against the ebola virus. My sales of NutraSilver -- the highest potency colloidal silver on the market -- have skyrocketed in the past few weeks, it is hard to keep up! I wrote a post a few months back about all the beneficial uses I have for colloidal silver. (Read it here) and I continue to use it in my daily life. But, there have been a few questions that people have -- about how to use it, about how it compares to the "made from home" silver solutions, does it kill beneficial bacteria, why the ppm is so high at 3600, etc. I will try to answer these questions here. Q: How does NutraSilver compare to the silver solutions you can make at home? A: The silver solutions you can make at home are ionic in nature. They are not true silver colloids, and they have a larger particle size and smaller particle surface area. Colloidal particles, when present in sufficient concentration, absorb visible light causing the colloid to exhibit an "apparent color". The apparent color is the complement of the absorbed wavelength. Silver ions do not absorb visible light and therefore appear as clear colorless liquids. All "colloidal silver generators" on the market produce ionic silver. There is no equipment for sale by any manufacturer that will produce 'true colloidal silver' consisting of mostly silver nanoparticles. Q: I read on a website that ionic silver is better than colloidal silver? A: You probably read that from a website that is trying to sell you ionic silver. Maybe what they meant is that ionic silver is better than silver proteins (which are many times mislabeled as colloidal silver solutions). In that case, yes, ionic silver is better. Perhaps the most impressive ability that NutraSilver has is that it can be safely diluted without sacrificing effectiveness. You can literally dilute one 30 mL bottle of NutraSilver with distilled water and make 38, 8 ounce bottles of the 10 ppm ionic silver - which comes out to less than $1 per a bottle. Just 13 drops in 8 ounces of distilled water and you’ve got the equivalent to the normal store-bought ionic silver. NutraSilver, when compared this way is hugely less expensive than store-bought products. There is really no comparison between ionic silver and colloidal silver. Ionic silver is a lot cheaper to make, yet manufacturers jack up their price. If you are paying more than $15 per bottle, then you are paying way too much for what you are getting. That being said, ionic silver is not "bad" -- it just isn't as potent as a pure colloidal silver such as NutraSilver. It is great for cuts and scrapes and even as a deodorant! Since it is clear in color (the easiest way to tell whether it is a colloidal silver or ionic silver) it won't stain your clothes if you put it in a spray bottle and use it as an underarm deodorant. I even have some at home for topical use! Q: Does NutraSilver kill beneficial "good" bacteria? A: Regarding NutraSilver killing the good gut bacteria, you don't have to worry. When taken orally, 98% is absorbed in the stomach and 2% in the large intestine, and 0% in the small intestine where the good gut flora reside. Q: Is NutraSilver safe for pregnant or nursing mothers? A: Yes, NutraSilver has no toxicity whatsoever. Q: Will taking NutraSilver for long periods of time make my skin turn blue? A: No. NutraSilver will NOT make your skin turn blue. The silver product to avoid is Silver Proteins, as discussed in the next question. Due to the high concentration of large silver particles, silver protein products are known to cause argyria, a condition that causes the skin to turn blue-gray. The US Federal Register listed the silver products that cause argyria as: silver salts, including silver nitrate, silver arsphenamine, silver chloride and possibly silver iodide (all forms of silver proteins). Q: Isn't a high ppm a bad thing? A: Most products claiming to be high concentrations of colloidal silver (typically in the range of 30 to 20,000 ppm) are in fact silver proteins. AVOID THESE. When talking about colloidal silver, a high ppm shows the potency of the silver. Of the three types of colloidal silver, silver protein products have the lowest particle surface area for a given silver concentration, making the silver inaccessible for safe human absorption and less effective for human use. So this is why you want to really do your research as to what really goes in to the product you are going to buy. AVOID Silver Proteins. 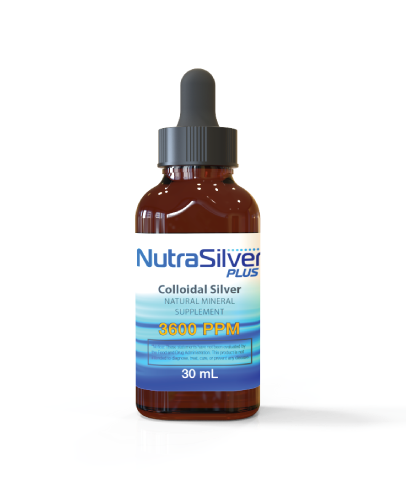 NutraSilver is a true colloidal silver, and does not contain any silver proteins. It is perfectly safe and extremely effective at the 3600ppm concentration. Q: What are the dosage instructions? A: If you have a serious health issue such as Morgellons disease, Lyme disease, Candida, or MRSA, click here to view instructions. 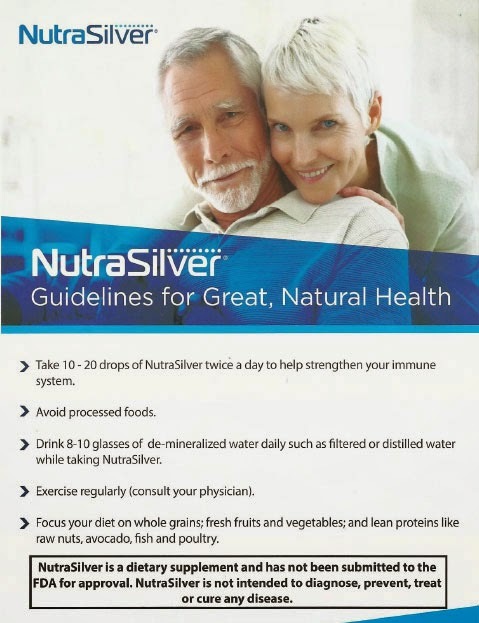 If you want to use NutraSilver for overall health, or to help prevent yourself from getting sick, please click here to view the instructions. Each bottle of NutraSilver contains approximately 600 drops. It comes in a 1-oz size dropper bottle. NutraSilver is 100% silver nano-particles and distilled water. NO ionic silver! Here are the instructions to use NutraSilver on a daily basis for great health. These are the directions when you don't have any big health issue but want to stay healthy. This is especially popular during the cold winter months of flu season. 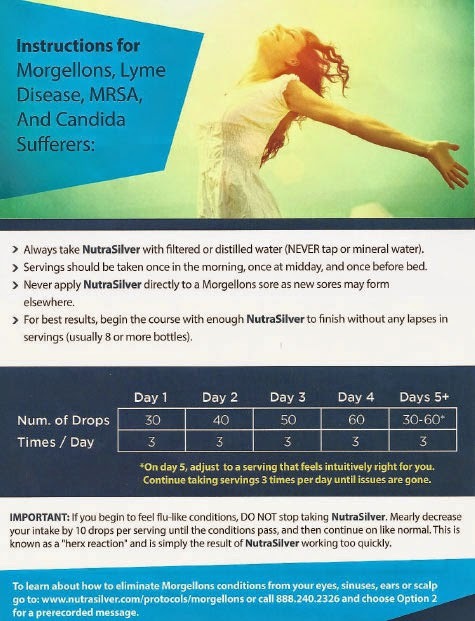 For instructions on how to use NutraSilver for Morgellons, Lyme, MRSA or Candida, click here. Labels: Dosage instructions for NutraSilver, how to take nutrasilver. Whether you are suffering from debilitating arthritis or you are just starting to feel your age when the weather gets cold and your joints start to ache, dealing with pain is no walk in the park. I have arthritis (due to injury) on both my right foot, my right heel and my right hand. These are all a result of injuries to those areas, and years later the arthritis pain sets in. I also have arthritis in my SI joint but I do not know where that came from -- I cannot pin point the cause. But I have inflammation in my hip joints and my hip bursae, (not arthritis but inflammation caused by who knows what). The combination of all these "issues" is extremely frustrating. So, here is my review. I am taking the below list of ingredients from their website. I have some issue with the vitamins they used because they are synthetically created in a lab and our bodies will not be able to absorb them effectively. Especially the B-vitamins folic acid and cyanocobalamin. They should have used at the bare minimum folinic acid if not folate. And they should have used methylcobalamin which is one of the most popular forms of "active" B-12. Unfortunately, most of the supplements out there contain these forms, so we won't ding them too much for that. They have a LOT of other good ingredients. Turmeric and Curcumin C3 Complex: Studies have demonstrated that at high enough levels, turmeric curcumin can lead to large and lasting improvements for arthritis patients. While reducing joint pain, this healthy ingredient will also boost your liver health, lower your cholesterol, and prevent Alzheimer’s. Olive Leaf Extract: Olive leaf oil contains a compound called oleuropein. This polyphenol is a powerful antioxidant, and prevents the buildup of uric acid. This in turn helps to treat and prevent gout. Its anti-inflammatory properties make it an excellent treatment for rheumatoid arthritis and osteoarthritis as well. Bromelain: This enzyme found in pineapple juice is excellent for reducing inflammation and is particularly effective in treating arthritis of the knee. How does it work? Bromelain naturally triggers the body to produce substances that combat pain and inflammation. It is also a digestive enzyme and can help with other health issues. Boswellin: This is the extract of Boswellia serrata, a form of Indian frankincense. Like turmeric curcumin, this herb extract has a long history of use in traditional Ayurvedic medicine. Clinical studies have demonstrated its effectiveness, particularly for osteoarthritis of the knee. Pine Bark: This extract is made using the bark of the maritime pine tree, Pinus pinaster. In a double-blind study, researchers discovered that participants who took pine bark experienced a 55% improvement in joint pain. It is also sometimes used as an alternative treatment for certain types of cancer. White Willow Bark: This is another herbal extract with a very long history of medicinal use. White willow bark has been prescribed to patients with inflammation and fever for thousands of years, clear back to 400 BC, when Hippocrates lived. The bark contains a chemical called salicin, as well as antioxidant polyphenols and flavonoids. Studies have demonstrated that these chemicals and other compounds make white willow bark an effective anti-inflammatory herbal extract. Its pain relief properties can be as effective as aspirin’s, and at a much lower dose. BioPerine: It has an unusual name, but believe it or not, it is simply black pepper extract. This extract is included in the supplement to boost its overall efficacy. How? BioPerine increases the bioavailability of other substances, helping your body to absorb more nutrition. With BioPerine included in our supplement, your body can benefit more from every vitamin, mineral and herbal extract we include. Vitamin B Complex: This joint support formula includes vitamins B1, B2, B3, B6, B9, B12, and B5. While these are in their synthetic forms as I mentioned, it seems to me that most all multi-vitamins and supplements that contain the B-vitamins have synthetic versions (so you have to watch out for that). What is pretty cool about this formula is that I have quite a few of these herbs that I take individually... the turmeric, the white willow bark, bromelain and boswellia. Because they all are included in this formula I can reduce the amount of pills I take everyday, which is nice! 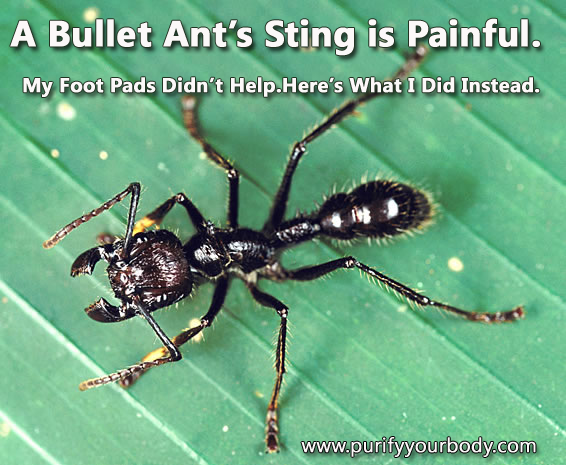 Bullet Ants - My Detox Pads Won't Work on Bug Bites! My detox foot pads are amazing at pulling out toxins via your lymphatic system. The best way to get access to your lymphatic system is through the palms of your hands or the bottoms of your feet. And the foot pads even work amazingly well on injured areas that are swollen. But they don't seem to work on bug bites! I haven't worn my foot pads for almost a week, because last Saturday I was hanging my laundry out to dry while wearing sandals, and I apparently was standing on an ant hill. But not just ANY ant hill, this one just happened to be a BULLET ANT HILL! So, you can imagine the pain of getting bit or stung by these ants as they swarm up your feet... and of course I took my sandals off, doing my ninja dance as I was trying to fling all these ants off me (they were the size of regular house ants too, so their looks were very deceiving!) And taking my sandals off to remove them made me.... barefoot... in their grass! Nonetheless, I have to say that it was a painful experience for me and now I hate doing laundry even more. My feet itched too much to wear my detox foot pads so I didn't wear them for almost a week. I wanted to point out that while my foot pads are amazing, I have tried them in the past on insect bites and THEY DID NOTHING. But.... witch hazel sure was helpful! I mixed witch hazel and lavender essential oil and dabbed that on my battle wounds. And it took the sting and pain and itch away for.... 5 minutes at the most. Then it came roaring back. So, next up in my arsenal.... BENTONITE! I made a Bentonite clay poultice...and it saved me. What you do is mix equal parts oil and water. I use whatever oil I have, sweet almond oil, grapeseed oil, jojoba oil, avocado oil, or if you only have olive oil, that should be fine. For this I just grabbed my avocado oil. Both the oil and water should be heated.... (the heat allows you to mix the clay a lot easier). Then, add the bentonite clay until you get to a consistency that you like. I go with a toothpaste thickness. Lastly, put this on your "battle wounds" and wrap in a bandage or gauze tape. Try to keep it on for at least an hour or so. The clay will draw out the venom from the bites. And it works AMAZING. MORAL OF THE STORY: Don't do laundry.